Holiday sale days like Black Friday, Cyber Monday, and Boxing Day drive huge profits for retailers. Deloitte is predicting e-commerce sales could reach as much as $134 billion this holiday season, compared with about $110 billion a year ago. When it comes to preparing for the holidays, understanding consumer and industry trends is the first step. After the holidays pass, return rates shoot up, and return rates in the world of e-commerce, run exceptionally high. To create a competitive advantage from your holiday returns, we've pulled together five quick tips that will help you increase sales, recapture previously lost returns and improve the customer experience during the holiday season. Give a second look at your returns policy to make it simple, predictable and transparent. If your policy is too complicated, it causes confusion and doubt, driving up calls to support and cutting into shopper spending. For the holiday season, consider extending your policy window. If you currently offer a 30-day return policy, up it to 60 or even 90 days. Research has found that the longer a consumer has a product in their possession, the more attached to it they become and less likely they are to return it. Another way to leverage your policy to increase holiday spending is by offering free returns. Free returns have proven to boost purchasing by as much as 357%, but it’s important to balance this expense with the cost of your product and overhead. By making a minor adjustment to your product price point, you can reap the benefits of "free" without putting pressure on your bottom line. Let customers see they are shopping risk-free. Your returns policy is as much a marketing tool as a retail necessity. Use your policy to set clear expectations and put shoppers at ease during the decision making process. 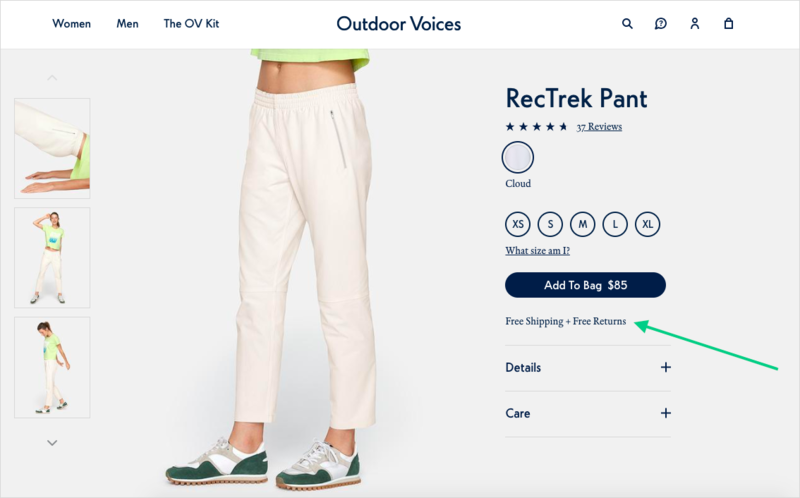 Outdoor Voices does this exceptionally well with Free Returns and Free Shipping prominently listed on both their product page and at checkout. The days of expecting a personal human to human interaction are gone. When shoppers need to make a return, they want to help themselves. Empower your holiday shoppers with self-service returns and exchanges. Third-party software solutions have emerged and evolved over the years to help online brands streamline the manual complexities inherent to returning and exchanging an item online. These platforms have improved the customer experience as well as the operational efficiency of processing a return. Today a gift giver has to be sure about the recipient's preferred tastes, size, and color. As a result, the vast majority of gift givers leave your site without completing the transaction and opting for an impersonal gift card instead. By optimizing your website for a seamless gift exchange experience, you're given the unique opportunity to earn the loyalty of two customers for the price of one: the giver and the recipient. 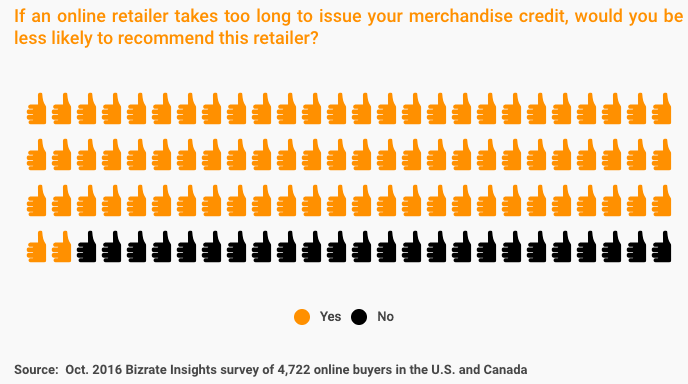 When an online merchant takes too long to process returns and issue credit, consumers become less likely to buy again. 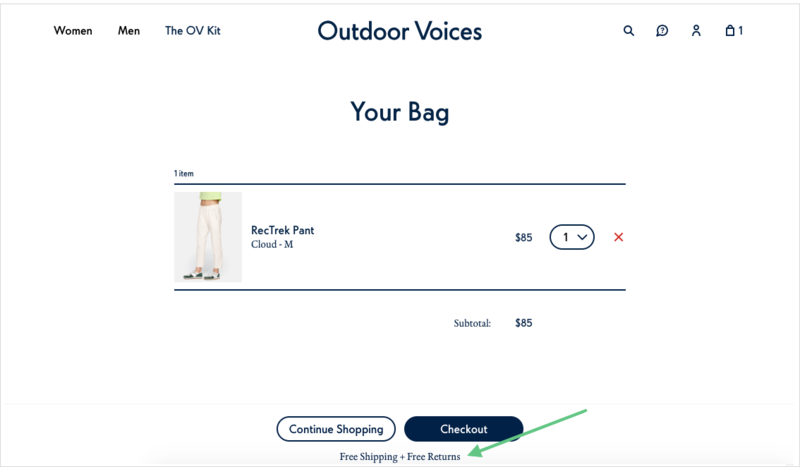 To help retailers offer an Amazon-grade refund experience, Returnly is powering an experience that fronts customers a credit at the start of the return process, rather than at the end of it. This boosts your customers spending power while building loyalty long after the spending season has passed. One way to speed up shopper refunds is to leverage APIs. Connect your existing reverse logistics systems and return location to automate the return and refund process. If you can't make back-end changes to speed up your current refund process before the holidays, consider adding front-end improvements such as tracking and email automation to keep customers informed throughout the process. By making it easy to track return refunds without having to contact customer support, it will help put shoppers at ease and reduce all the “Where is my refund” calls to support. As big investments are made to drive Black Friday and Cyber Monday sales, don’t forget about the importance of product returns. To compete and be successful this holiday season, online retailers need to focus on all aspects of the customer experience - including post-purchase. That could include anything from longer policy eligibility windows, free returns, gift exchanges, faster refunds or other experiences that give customers the flexibility they need to make a purchase. This strategy will help you drive sales, delight shoppers and boost your bottom line.